I also got the latest Ozotic polishes in the post today from Picture Polish. I got all four of the new Mish Mash polishes and I can confirm that they are all holographic multi-chromes. Hello Peter from Lumineye. I wonder where you got that idea from. You've been reading my blog, haven't you? WE CAN GET SUSPENSION BASE HERE IN AUSTRALIA. That's right. The price is as good if not better than TKB's and the quality is fantastic. As you can see in these pictures, its super shiny and the most important thing is it suspends stuff. I've used it with spectraflair and various pigments and so far there has been no settling. 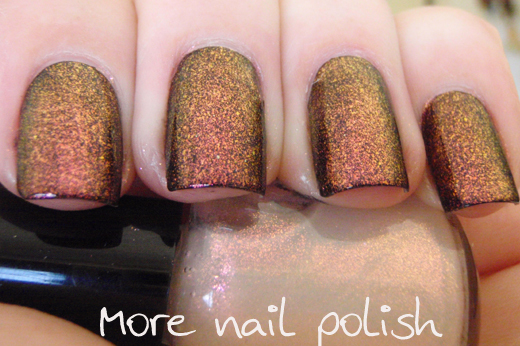 These swatches are all with no top coat so you can see how shiny it is. If you are interested in buying some suspension base, please email me and I will give you the details of where you can buy it from. When you're buying that suspension base, you may like to buy some of this pigment too, which is available from the same supplier. It's called Rona Volcanic Sparks and in it's powder form it's a white iridescent looking powder. I simply mixed about 5 grains of barley size spoonfuls into my new suspension base, in a mini 5 ml bottle. I then applied two coats over a black base. 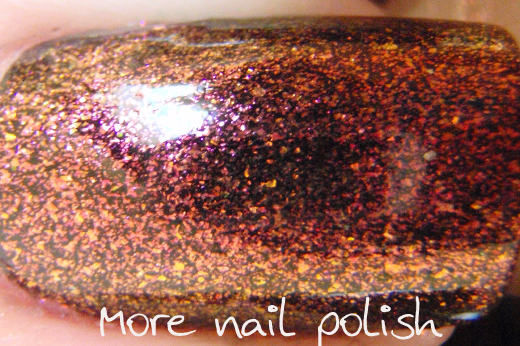 This polish shifts from a pink and maroon through to orange and yellow. It photographs the best in the shade or indoors, because in the sun in it so super sparkly it's hard to see the colour shift. In this up close macro shot, you can really see the glass flecks. The finish is totally smooth too. 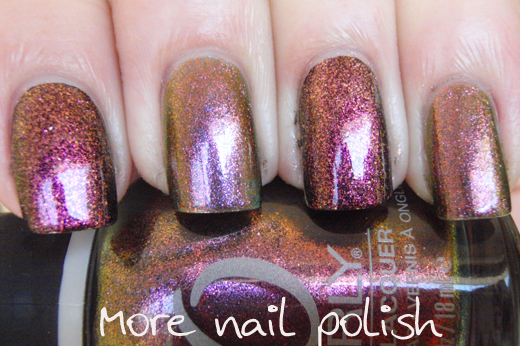 As soon as I applied this it reminded me of another polish., the much loved Orly Cosmic FX Space Cadet. I did a comparison swatch here. They look quite different because of the black base under the franken, but the base colour of the flecks in the polishes are really similar. As you can see, they both shift the same colour. I think the particle size is also about the same, it just looks like the franken is much coarser because it is layered over black. Up close again, franken over black on the left, Space Cadet on the right. So what do you think? Pretty awesome right. I think it would be pretty easy to create a franken very similar to Space Cadet if I were to mix some tints into the polish. But for a real quick franken topcoat I was so happy with the effect of this one. International ladies, sorry I don't know where you can get this pigment from overseas, but stay tuned tomorrow as I have something you can get your hands on easily which is just as pretty as this, but a different colour. wow that is so pretty. Ugh, if anyone knows where I one can find suspension base in the UK I will send candy in return for said info. Wow you are the franken queen!! You really should sell this stuff! LOL how many manufacturers do you know? Beautiful polish as always. 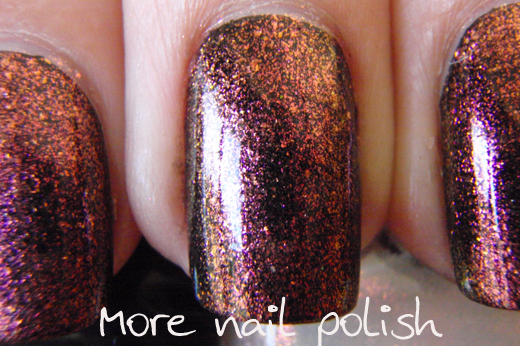 Aarrrgh, please stop showing these amazing pigments! Did you receive my last email? Anyway, I got te colour changing pigments, thank you again from here too! Gorgeous! 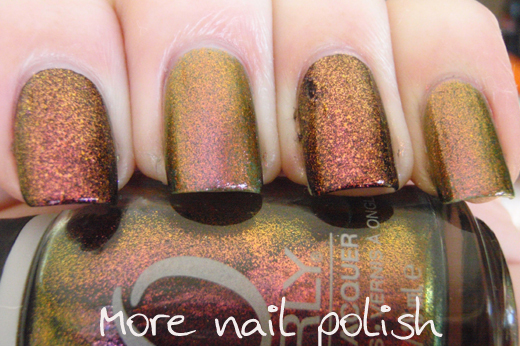 I ordered the new Ozotic quads from Llarowe here in the states and am dying, dying I tell you, to get them! And I can't play with my pigments from TKB cuz I don't have enough suspension base and they won't get more in til Nov!!! Gaaaaah!! That is so gorgeous! I didn't like Space Cadet (yes, I know) but this is so nice. It's super awesome! I could tell right away that it reminded me of Space Cadet colors. Good find! Holy moly. That is incredible! 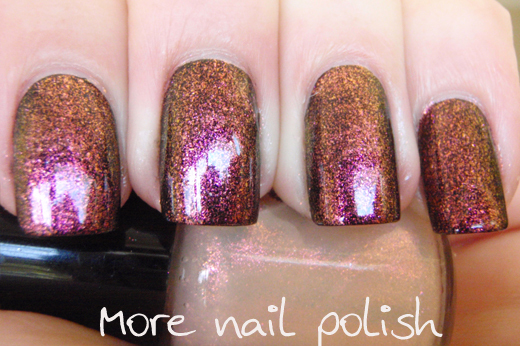 I would love to know where I can get this pigment in the US. Is this something TKB sells too? I haven't bought from TKB for ages, but to hear their minimum shipping cost is now $25, OUCH! Other good places to buy are glitter unique and solar colour dust, I have bought from both, but not for a while, so can't comment on their shipping prices. Kleancolor stamping and awesome Nail Mail!